Last Friday, a single car derailment, pictured above, occurred in a Canadian National Railway rail yard in Sarnia, Ontario. Only the tank car was damaged, no injuries were reported and CN operations were not delayed. However, in the immediate aftermath of the Lac-Mégantic disaster, Canadian politicians are especially mindful of rail safety incidents; or at least especially reactionary. The next day Elizabeth May, Green Party MP for Saanich—Gulf Islands, British Columbia, and the only member of the Green Party caucus in Ottawa, tweeted about the incident. 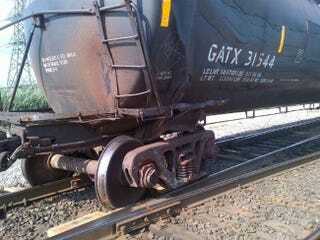 After the tweet, Sarnia's mayor started receiving calls about the 20 car derailment in his town. When he contacted CN, he was told the incident was about as serious as a flat tire. The mayor has since communicated his displeasure to MP May's office. When asked for comment, MP May's office would not discuss the source of the rumor.